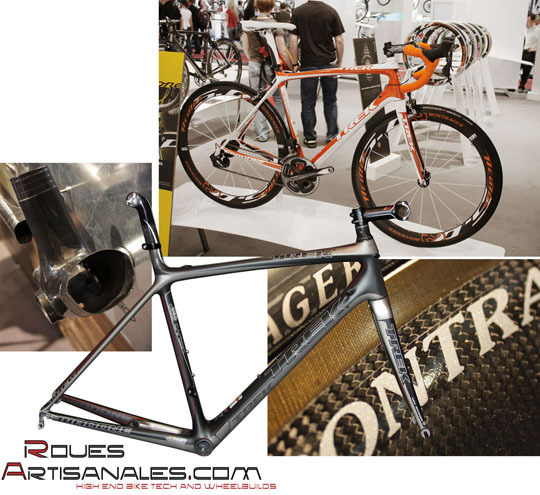 ← Canyon Ultimate CF, un vélo aux couleurs de l’arc-en-ciel? 220g instead of 210g of the former wheels. durability compared to the previous version. 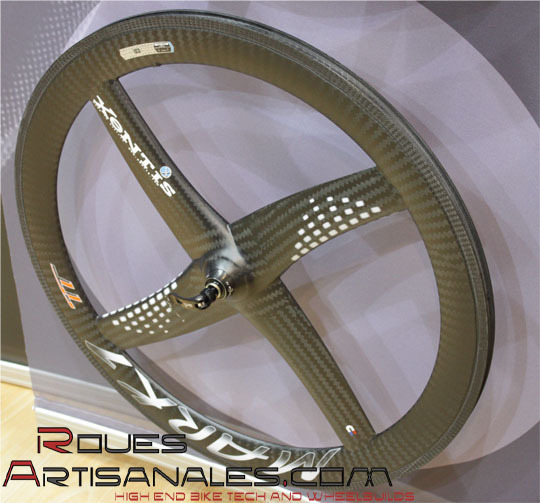 – The spokes are totally changed : they are not made of a single carbon ovalized rod but with four different layer to increase impact resistance. 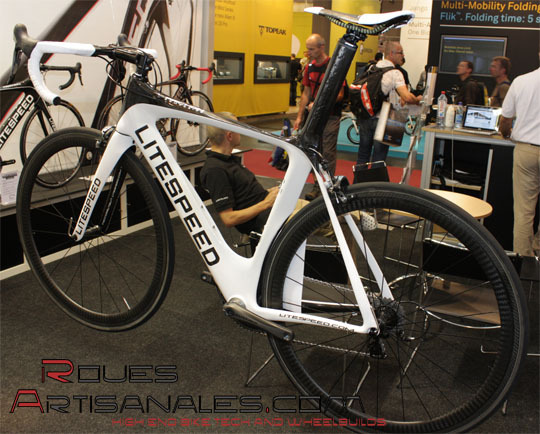 – The torque resistance of the rear wheel is 4 times higer the one of the previous wheel, and the lateral stiffness is 50% higher. wheel is loaded with 60 to 90kg through its axle, then bent within more or less 15° on both sides to simulate a corner. Even with 2 spokes less on the front, and 3 spokes less on the rear, the wheels passed the tests! Another test conist of spinning the wheel at 35km/h through its hub and a chain, while the rim/tubular is spinning at 36km/h through the drum. This tests the resistance of the wheel to extreme accelerations. The wheel resists during 136h, most of the lightweight wheels break after 20h. Finally, Paul Lew claims his wheel is 900g. 50g more than the previous Lew Racing. These 50 extra grams are certainly worth if it comes with high reliability. A whole RZR range is on its way. the 66mm deep will see the light after the 46. 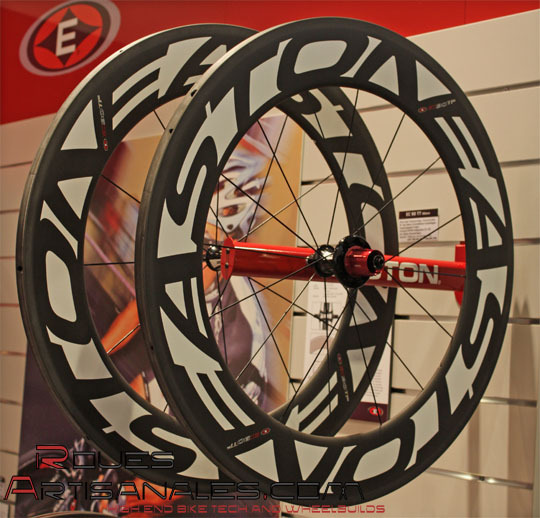 The EC90 TT are made for extreme speed, for time trials! 90mm deep rims, 12 blades front spokes, 16 rear. The front wheel axle receives aero end caps ! Take care to place them well when using the wheels ! From a finish point of view, the rims are … perfect ! Let’s not mince our’s words! 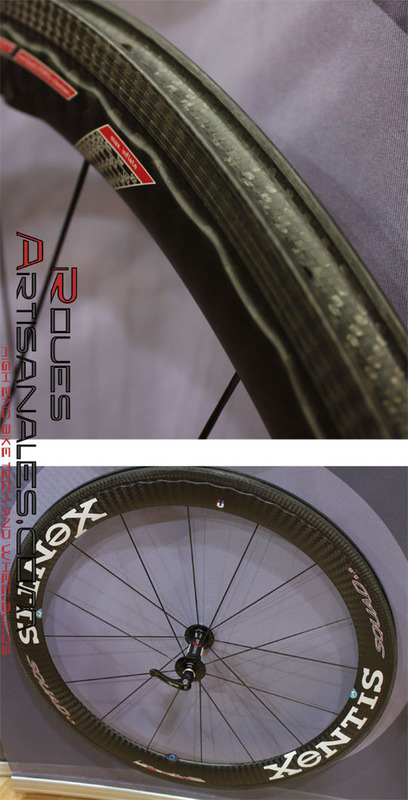 Xentis clincher wheels feature a special reinforcement below the brake track. It seems like it is a reinforcement to deal with the cons of the clincher pressure. vertical compliance and torsionnal stiffness thanks to the strategic layup. The fork features the same layup. 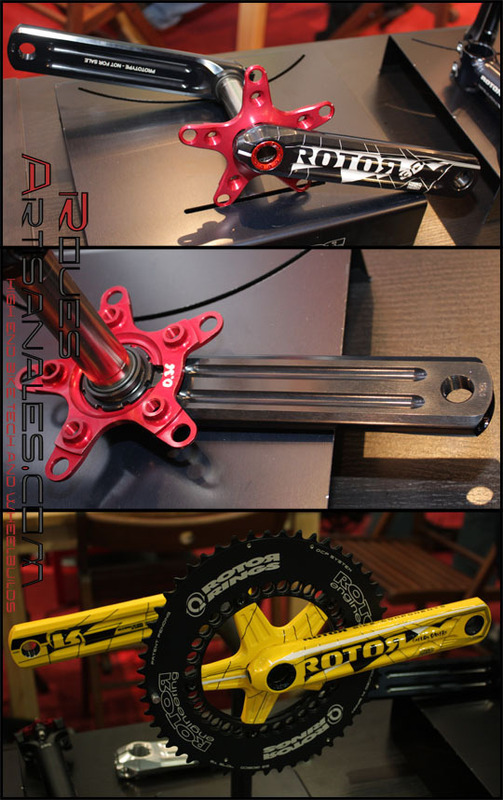 SX stem and 3D crankset wtook place in Rotor booth. The SX receives 4 bolts, for higher stiffness than the S1, which was really needed. Regarding the crankset, it appears for the same reasons: stiffness, strength. 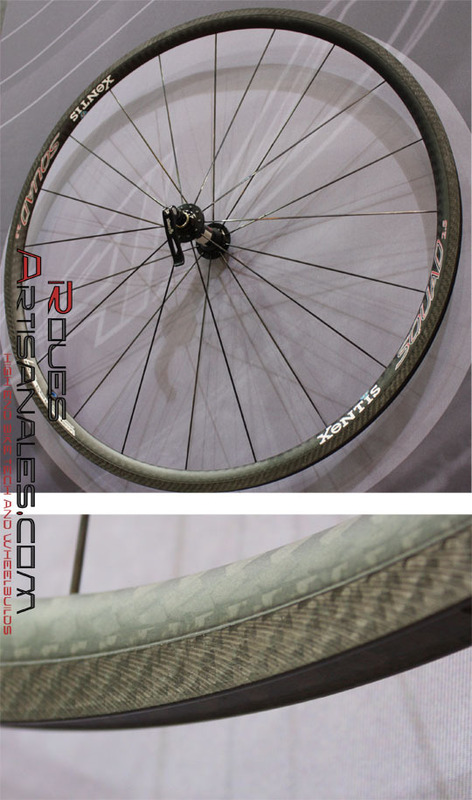 At Token a « new product » was unveiled, this is a wheelset with carbone spokes. 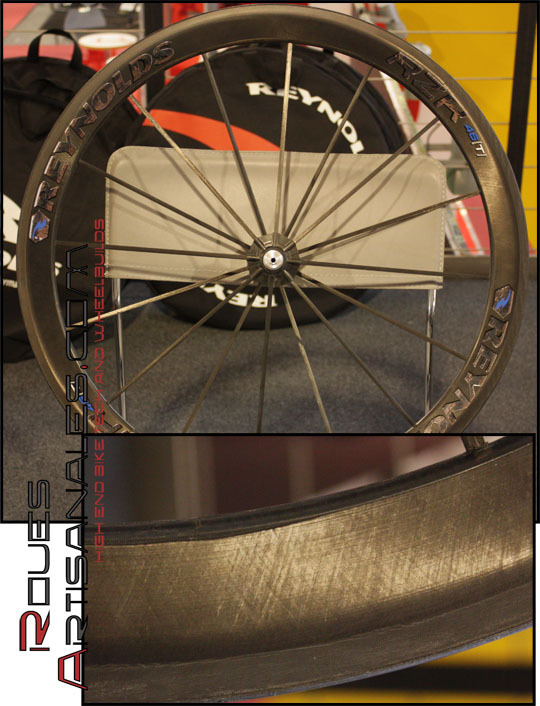 We have seen this pair of wheels on a couple of booth, it is made by Equinox/Gigantex. 1’ ¼ upper steering diameter and 1’ ½ lower, with a BB30, the Archon C1 receives a high modulus carbon wreinforced with « nano » fibres. 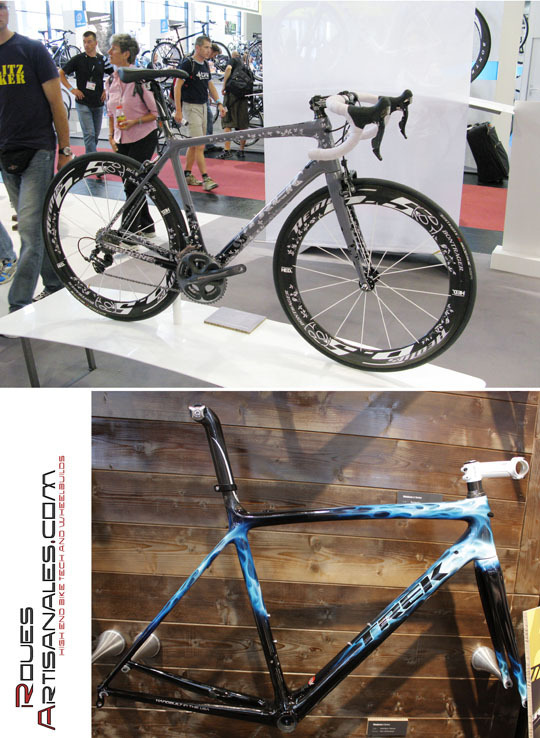 The Madone serie 6 is the newest frame at Trek. 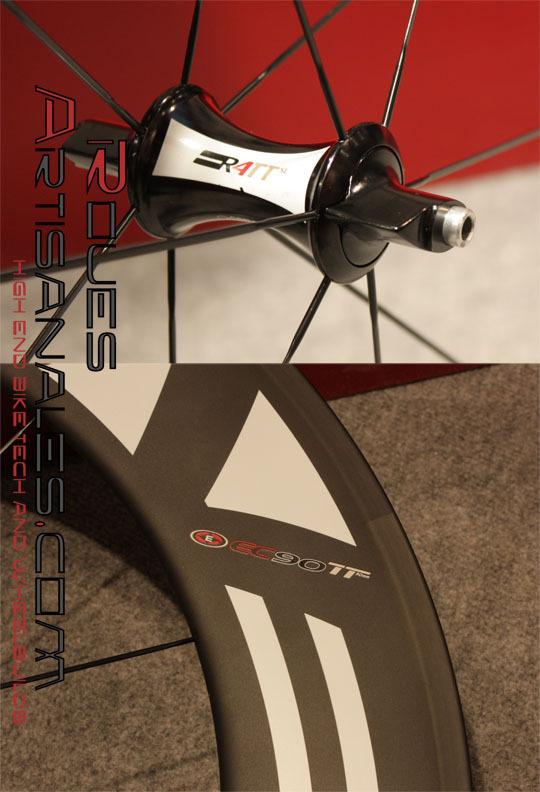 They worked on the comfort as well as on the asymetrical bottom bracket. 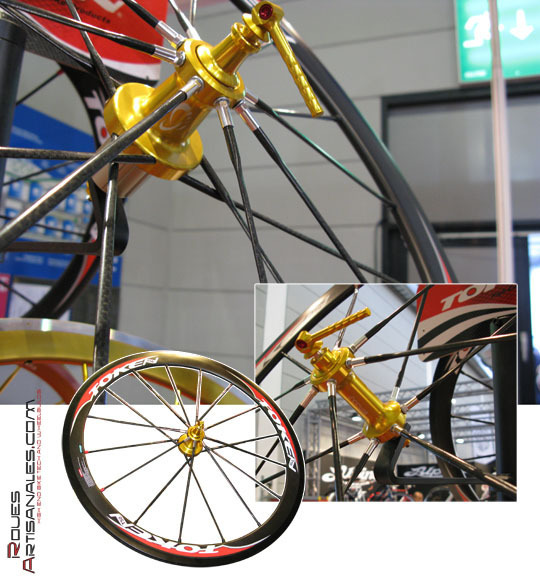 The bottom bracket bearing surface is made as a step of the frame building, thus it is in carbon, which makes it very reliable. The seat tube has been lightened of 20g and offers 20% more compliance. Trek team has been able to lighten the fork and frame of 100g. 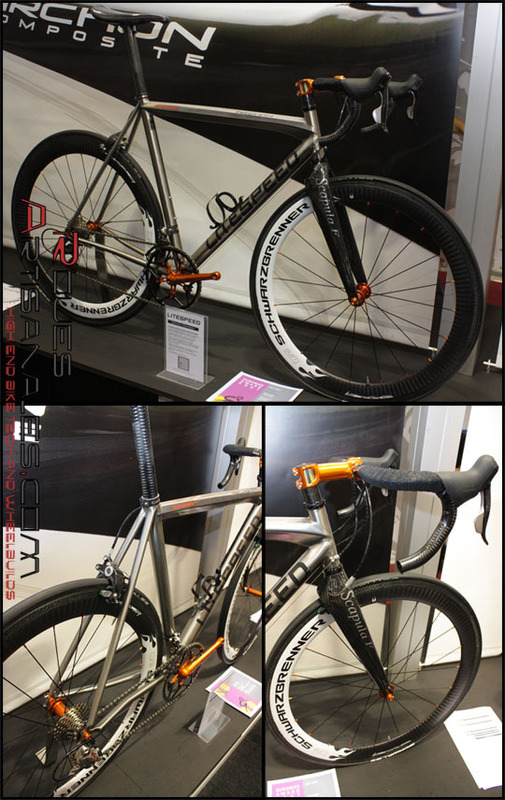 The fork, like the bottom bracket, is asymetric. The steering tube is oval instead of round, which comes with 20% higher lateral stiffness, and 15% more comfort. 30g are also shaved off thanks to this tip. 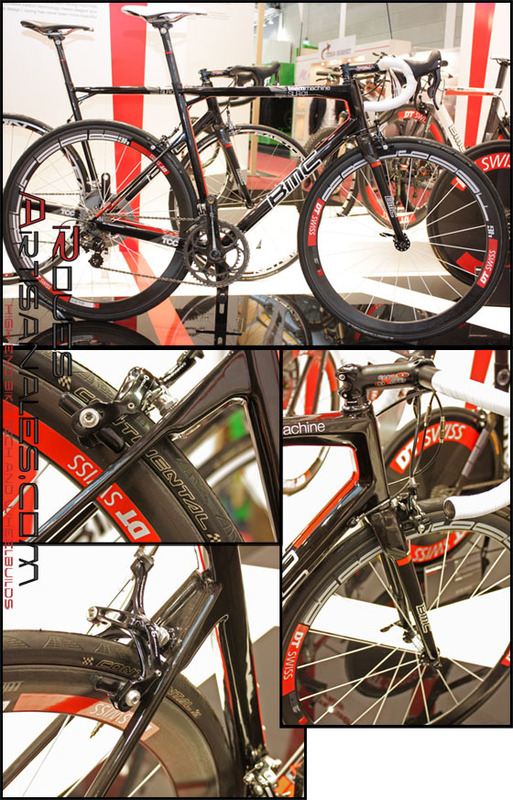 Finally, a sensor inserted inside the drive side chainstay measures the pedaling frequency, speed and distance. It is ANT+ wireless compatible: Powertap, Garmin, Srm, Bontrager.